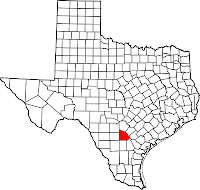 Atascosa County is south of San Antonio on Interstate Highway 37 in the Rio Grande Plain region of south central Texas. Jourdanton, the county seat, is located on state highways 16 and 97 in central Atascosa County thirty-three miles south of San Antonio and 100 miles northwest of Corpus Christi. 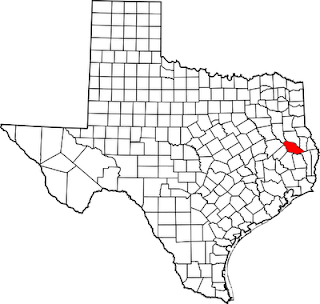 The largest city in Atascosa County is Pleasanton with a population of approximately 8,266 persons. The population density is approximately 31 people per square mile. The median income for a household in the county is approximately $33,081. Other cities include Poteet (pop. 3,305) and Charlotte (pop. 1,637). The county covers 1,218 square miles of level to rolling land. Elevation ranges from 350 to 700 feet. The soils are generally deep with loamy surface layers and clay subsoils. In Atascosa County, the subtropical dry land vegetation consists primarily of cactus, weeds, grasses, thorny shrubs and trees such as mesquite, live oak and post oak. Approximately 40 to 50 percent of the county is considered prime farmland. Wildlife in Atascosa County includes white-tailed deer, javelina, turkey, fox squirrel, jackrabbits, foxes, ring-tailed cats, skunks, and possums. The main predators are bobcats and coyotes. Ducks, cranes, and geese migrate across areas of the county. Many stock tanks are stocked with catfish, bass, and sunfish. Mineral resources include clay, uranium, gravel, and oil and gas products. Other minerals and products include caliche, lignite coal, construction and industrial sand, and sulfur. The climate in Atascosa County is considered subtropical. The winters are generally mild and the summers can be very hot. The average annual temperature is 70°F. Temperatures in January usually average a low of 40° F to an average high of 65°. and in July range anywhere from 74° F to 97°F. The average annual rainfall is approximately 27 inches. The average relative humidity normally ranges froma low of 51 percent to a high of 86 per cent. There is no significant snowfall that occurs in this county. The growing season averages 282 days a year. The sun shines an average 65 percent of the daylight hours which is good for solar power applications. Major highways in Atascosa County include Interstate 37, U.S. Highway 281, State Highways 16, 85, and 97. Andrews County is located in the southern High Plains. It is bounded on the west by New Mexico, on the north by Gaines County, on the east by Martin County, and on the south by Winkler and Ector counties. 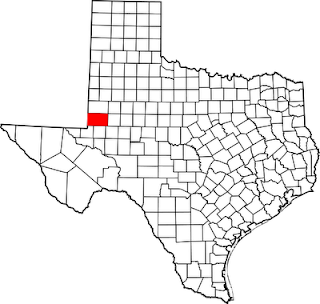 The center of the county is at 32°18' north latitude and 102°50' west longitude, 110 miles southwest of Lubbock. Andrews County encompasses 1,504 square miles of level, rolling prairie land typical of the southern High Plains. The city of Andrews is the county seat of Andrews County and the population was 13,004 at the 2000 census. Sandy soils predominate except in the east, where red clay loam soil types are found. The elevation varies from 3,000 feet in the south to 3,400 feet in the north. The average annual rainfall is approximately 14.5 inches. The temperatures range from a January average minimum temperature of 30°F to a July average maximum temperature of 96°F. The growing season is 213 days. Livestock production accounts for roughly two-thirds of the $11 million average agricultural income in the county. Crops of cotton, sorghums, grains, corn, and hay account for the rest of the county’s agricultural production. Approximately 8,000 acres of land is in irrigation for crops. Oil and gas production and its related services produce the majority of the county's income. Andrews County ranks among the leading counties of the state in median annual income. It is also one of the leaders in annual oil production. The oil industry is a major source of employment. By the end of 1982 the county had produced over two billion barrels of oil. The county's road network includes Highway 385 (north-south), Highway 176 (west-east), and Highway 115, which bisects the other roads at Andrews. Communities include Andrews, Frankel City (pop. 1,344), and Florey (pop. 25). Prairie Dog Town and the Oil Museum are two of the county's most popular tourist attractions. Angelina County is on U.S. Highways 59 and 68 northeast of Houston in the East Texas Timberlands region of northeast Texas. Lufkin, the county seat and largest town, is ninety-six miles northwest of Beaumont and 120 miles northeast of Houston, at 31°20' north latitude and 94°43' west longitude. The county is bounded on the north by the Angelina River and on the south by the Neches River. It comprises 807 square miles of gently rolling terrain and is densely forested with pine and a great variety of hardwoods. The altitudes in Angelina County range from 200 to 380 feet above sea level. The Angelina River drains the northern and eastern parts of the county. The Neches River drains the southern and western parts. The largest body of water in the county is Sam Rayburn Reservoir. It is located on the Angelina River. The reservoir extends into Jasper, Sabine, Nacogdoches, and San Augustine counties. It covers approximately 114,500 acres and affords residents in the county good boating, fishing, and swimming. It also provides resources for municipal water storage, agricultural, and industrial needs. It is also used for flood control and to supply electric power. Most of the county is surfaced by sandy soils containing lignite and bentonite. This soil underlies rangeland and cropland and is used for mineral production. The northernmost edge of the county, the area north of Lufkin, is covered by thin to moderately thick clay type sands over steep slopes and rolling hills. In the piney woods area, longleaf, shortleaf, loblolly, and slash pines provide excellent timber. Hardwoods in Angelina County include several types of gum, magnolia, elm, hickory, and oak. Anywhere from 20 to 30 percent of the land is considered good for farming purposes. The major mineral resources are natural gas and oil. Average annual temperatures range from an average high of 94° F in June to an average low of 39° in January. Rainfall averages approximately 43 inches per year. The growing season generally lasts for 244 days. Be aware. Be prepared. Be informed. Water will be your biggest problem. The Nueces River does run down here, but it is brackish all the way to the low water dam at Labonte Park, just as you enter Corpus Christi from I-37. Oso Creek also runs along the southwest side of Corpus Christi, and it too is brackish for quite a distance upstream. That being said, directly on the coast the water table is fairly high, only 3 or 4 feet in places. Ranchers on Padre Island watered their cattle simply by digging pits a few feet down. This can be done in my back yard in Flour Bluff on the Encinal Peninsula as well (though it is against city "code"). Areas north and west of Corpus Christi Bay typically receive more rainfall, as do the Kingsville and Rio Grande Valley areas. Land right on the coast is typically sandy loam, with large areas of clay as well. Crops grow well a few miles inland in the rich, brown soil. There is little tree cover from the north shore of Corpus Christi Bay and the Nueces River southward, mostly huisatch and mesquite. North of the bay, live oaks proliferate. South of the Encinal Peninsula, the King, Kennedy, Yturria, and El Sauz ranches cover most of the land between the Laguna Madre and US 77, all the way to Port Mansfield, about 80 miles as the crow flies. The lone exceptions are Riviera Beach and Loyola Beach on the western end of Baffin Bay, near Kingsville. North and west of Kingsville is brush land, lots of smaller ranches, and little to no surface water. On the plus side, fish are plentiful! Speckled trout, red drum, black drum, and southern flounder are the major varieties, along with sand trout, golden croaker, gafftop and hardhead catfish, the occasional snook, pompano, and offshore species like whiting, bluefish, king mackerel, spanish mackerel, wahoo, yellowfin and blackfin tuna, red/gray/vermilion/mutton/mangrove/and yellowtail snappers, amberjack, jewfish, strawberry/warsaw groupers, scamp, cobia...... We also have plentiful stone crab, blue crab, oysters, scallops on occasion, brown/white and Gulf species of shrimp, and more. Migratory birds love this place as well. Many species of ducks and geese winter here, or at least stop by for a while (I hear mesquite grilled whooping crane is delicious! Heh heh heh....). There are many, many resident species of birds here. It's a bird shooter's paradise (both gun and camera). Buying Land in Texas for A Retreat? If the time is right to buy yourself some land in Texas for a retreat or bug-out location, you should be aware that buying land in Texas is no different than buying land anywhere else. You will need to be careful and make the right choices. This will insure that the Texas land that is for sale meets your needs. You should also be aware of the important legal issues that are involved. What is a Land Deed? The definition of a Land Deed in Texas is the same as most everywhere else. It is a legal document designed to transfer real estate property in the State of Texas. There are two types of deeds which are primarily used for the transfer of ownership of land in Texas. The first one is the Warranty Deed and the other one is the Quit Claim Deed. The Warranty Deed lives up to its name. It is used when the seller of Texas land uses the Deed to make certain guarantees to the buyer of Texas land. There are three basic parts (or covenants) associated with the Warranty Deed. 1.) The Covenant of Seishen in which the seller of Texas land guarantees that they own the piece of Texas land they are selling to the buyer and that they, indeed, have the right to sell it. 2.) The Covenant Against Encumbrances, in which the seller of Texas land guarantees to the buyer of Texas land that the Texas property they are selling (or the piece of Texas land) is free of encumbrances or claims against it such as mortgage liens, tax liens or any other form of liens. 3.) The Covenant of Quiet Enjoyment in which the seller of Texas land guarantees to the buyer that, after the sale, should anyone show up and try to lay claim to the piece of Texas land that has been purchased by the buyer, the seller will defend the buyer’s rights to the Texas land they have bought from the seller. Generally speaking a seller and buyer are free to negotiate and agree to alter any of the terms and conditions of a Warranty Deed until they are both satisfied with it, but, in principal, these are the three parts to it. Compared to the Warranty Deed a Quit Claim Deed contains none of these guarantees. The basic situation here is that the seller of the Texas piece of land or Texas property tells the buyer: “If I own this piece of Texas land or Texas property, I am selling it to you and you take it “as is.” This is the classic caveat emptor situation – Buyer Beware! So be careful when purchasing land for your retreat or bug-out location. Make sure you are actually getting what you are paying for and a guarantee that is worth something. We are doing fine, just trying to get as much in order as we can. We moved into a new house, and are wrapping up the sale of our first home. Getting the mortgage monkey off our back (the new house is from a family deal). As I watch the daily destruction of the world economic system, i find that the closing date can’t come quick enough. I want to be done with the BS that's been stuffed down our throat about this consumer/debt charade. No mortgage= pay down credit cards= making more progress on preps= getting truly independent. It will be a long road, but my wife and I are excited. I have also been reading the blogs less. It seems nearly everyone has retreated into this angst and fear mode. Not as much productive/useful writing going on. They are either spinning their wheels about Obama taking our guns away, or have hit the wall in respect to the financial crisis(which I find to be far more pressing and depressing). I just find it hard to believe that gun control is seen as a vital issue right now. The new President will be swamped just trying to stop the bleeding (raiding of the treasury) and get people back to work. It may be on their back burner, but no gun bill is going to be the first order of business for this administration. With that said, I was amazed at how the stock of ARs and M4 clones has dwindled at my local gander mountain. The general public shares the same fears, both of the financial collapse and of a gun grab. This hopefully also means that more people are prepping in other areas, too. Even with these insanely low gas prices, I do not trust the oil supply, as all signs are still pointing to significant production decreases. I find it hard to believe that oil companies are shelving new exploration projects just because oil is lower than 70 a barrel. It all stinks to high heaven. I hope all is well with you. As the number of bailouts being proposed by our politicians continues to expand at an ever increasing rate, it seems as if there will be no end to the string of bailouts sweeping across our country as many companies with unsound fiscal policies have dug themselves into a very deep financial hole. Pickdog has furnished us with a link to a very insightful article about the real financial monster in our economy. It seems there may not be enough money in the world! The myth has quickly taken hold that the global financial crash was caused by bad mortgages. This has allowed rightwing hate-mongers to blame the meltdown on the "liberal" programs that encouraged home ownership among a small percentage of lower-income people (a poisonous canard that parts of the mainstream media have actually done a fairly good job of knocking down), while "progressives" of various stripes have denounced banks and other financial institutions for pushing over-easy credit on people who couldn't really afford it. Unsustainable mortgages are a key factor in the global crash, of course. And many people (most of them white, by the way) did take out mortgages they would not be able to afford if the housing bubble ever burst, which it has, most spectacularly. And yes, it is undeniable that the financial services industry has been tempting people with easy credit like schoolyard pushers flashing reefers. ...the dark heart of the global financial system [is] the $55 trillion market in credit derivatives and, in particular, credit default swaps, the mechanisms routinely used to insure banks against losses on risky investments. This is a market more than twice the size of the combined GDP of the US, Japan and the EU. Until it is cleaned up and the toxic threat it poses is removed, the pandemic will continue. Even nationalized banks, and the countries standing behind them, could be overwhelmed by the scale of the losses now emerging. This market in credit derivatives has grown explosively over the last decade largely in response to the $10 trillion market in securitized assets - the packaging up of income from a huge variety of sources (office rents, port charges, mortgage payments, sport stadiums) and its subsequent sale as a 'security' to be traded between banks. Plainly, these securities are risky, so the markets invented a system of insurance. A buyer of a securitized bond can purchase what is in effect an insurance contract that will protect him or her against default - a credit default swap (CDS). But unlike the comprehensive insurance contract on your car which you have with one insurance company, these credit default contracts can be freely bought and sold. Complex mathematical models are continually assessing the risk and comparing it to market prices. If the risk falls, the CDSs are cheap; if the risk rises - because, say, a credit rating agency declares the issuing company is less solid - the price rises. Hedge funds speculate in them wildly. While every bank tries to pass the toxic parcel on to somebody else, the system has to find the money. So will compensation for the near valueless contracts and thus now uninsured debt ultimately be made - and by whom? And because nobody knows - not the regulators, banks or governments - who owns the swaps and whether they are credit-worthy, nobody can answer the question. Maybe holders of insurance policies will get the cash due to them, but will that weaken somebody else? The result - panic. This is the ultra-dangerous downward vortex in which the system is locked. It is why share prices are plummeting. As recession deepens, there will be defaults on securitized bonds and the potential collapse of more banks outside the G7 ring-fence. Nobody knows what proportion of the $55 trillion of credit default contracts that have actually been written will be honored and who might bear losses running into trillions of dollars. This is the beast in the dark that is haunting the feckless leaders of the developed world: $55 trillion of unaccountable debt, and no way of knowing how much of it is even now being flushed down the toilet, taking the global economy with it. Still, U.S. elites will try to impose as much of a structural adjustment as they can get away with, in order to make the bottom 80% of America pay the price for the elites' spectacular screw-ups. The Washington Post has already started writing about how the current crisis demonstrates that we must cut Social Security. Look for much more of this to come. The only slim hope we have for any genuine reform -- even an imperfect, conflicted, compromised reform, which is the only kind we will ever have in this world, until the lion lies down with the lamb -- is that the sheer scale of the real problem -- the $55 trillion beast, the very real potential for the complete destruction of the global economy, and the state power that depends upon it -- might force some politicians to turn apostate, renounce the market cult, and bite the hands that have fed them for so long. Absent this near-miraculous possibility, we will be left with yet another rickety house of cards, slapped together on the fly -- largely at the malefactors' direction and for their benefit -- while the beast gapes wide his ponderous jaws, and prepares to swallow us whole. WASHINGTON (AP) -- Regulators shut down Houston-based Franklin Bank and Security Pacific Bank in Los Angeles on Friday, bringing the number of failures of federally insured banks this year to 19. The Federal Deposit Insurance Corp. was appointed receiver of Franklin Bank, which had $5.1 billion in assets and $3.7 billion in deposits as of Sept. 30, and of Security Pacific Bank, with $561.1 million in assets and $450.1 million in deposits as of Oct. 17. The co-founder and chairman of parent Franklin Bank Corp., Lewis Ranieri, is credited with inventing mortgage-backed securities two decades ago, but apparently was unable to save his own company from getting ensnared in the home-loan bust. Hope none of us had accounts there! Keep a sharp eye on your banking institutions folks, and keep on preppin'.